City of Dreams Manila celebrates Easter with diverse offerings for everyone’s delight – from Easter-themed confections at Chocol8 and Café Society; How to Train Your Dragon-themed Easter egg hunt and other activities at DreamPlay; an acoustic night of music at The Garage with special guest performer Jinky Vidal; to a new Omakase menu for the month of April at Nobu Manila and a rejuvenating Easter staycation and wellness packages at Nobu Hotel and Nobu Spa, respectively. Indulgent treats await guests at Chocol8 with unique handcrafted Easter chocolates by Head Chocolatier Tweet Obsequio, including Chocol8 bunnies in white, milk and dark variants (P200 each); Egg-xciting chocolate dragees (P1,800) and chocolate sculptures such as Easter Bunny Hop (P1,600), and Mr. and Mrs. Egg-xtravagant (P1,200 each), among others. 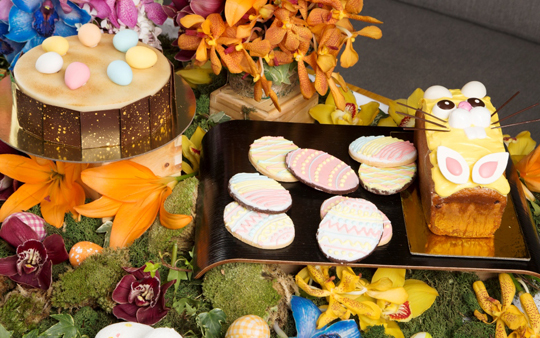 Sweet creations at Café Society consist of Lemon Bunny Cakes (P1, 500); Easter White Chocolate Brownies (P900);Easter Bunny Coconut Carrot Cake (P260); and Easter Egg Cookies (P290). On Easter Sunday, families can avail of the Easter VIP Package for P1,499 nett and get access to exciting How To Train Your Dragon-inspired activities happening from 9 a.m. to 2 p.m., including an exclusive dragon-themed egg hunt replete with a specially-designed string bag; dragon egg painting activity; a unique 4-D movie experience at Dream Theatre; and a video outtake from a 360-degree spin camera. For Easter and the rest of the month, Nobu Manila is highlighting an eight-course Omakase for P5,600++ per person. The dinner menu starts with zensai or appetizer of seared scallop with vegetable salsa, followed by an assortment of nigiri sushi; seared Tachiuo (beltfish) with beets puree; salmon shiso roll set in jalapeno dressing; shiitake crusted king prawn with bacon furekake and onigiri; marinated lamb chops with brussel sprouts and heirloom carrots puree; and clam miso with cilantro. The meal is capped off with blossom tiara, a sweet combination of chocolate mousse, orange cream jelly, yuzu curd, and yuzu cream.